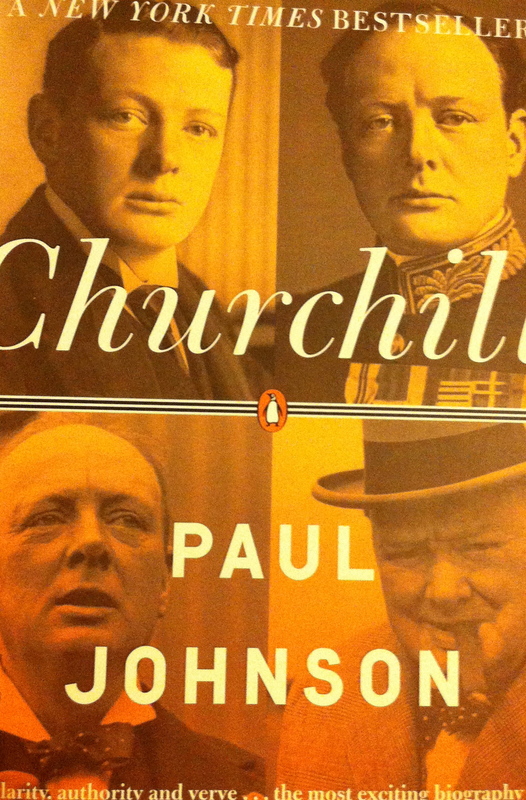 Discovering Paul Johnson’s Churchill, was a happy accident. What initially drew me to the book was its understated elegance: the attractive cover, the one and a half double spaced lines in beautiful bulmer font, the economy of images, the elegant prose. As it turns out, these pleasing aesthetic qualities are matched by the book’s intellectual merit. This is an unmistakably favourable portrait of Churchill, but it is not simply a biased account of a preeminent life. The author is too sophisticated and erudite a scholar to write a hagiography. Johnson’s earlier writings (his bibliography is quite impressive) demonstrate an extraordinary command of history and the critical essay. In this book, one senses that he has nothing left to prove. The biographical impulse of exposing an unknown secret here, adding a new piece of information there, is held in check. He simply writes about a subject that brings him a measure of joy. Indeed, the premise of Churchill is banal: to meditate upon the man’s brilliance. ‘Why did he glow so ardently?’ Johnson asks rhetorically in his introduction. The concepts of success and failure are the pegs upon which Johnson pitches his metaphorical tent both in terms of the book’s structure and its thematic focus. Johnson’s canvas is inhabited by opposing archetypes: winners and losers, the bold and the timid, those who succeed in their ambitions and those who fail. Chapter titles such as ‘The Lessons of Failure’, ‘Success and Disasters’ and ‘Supreme Power and Frustration’, are indicative of this. Acutely sensitive to the idea that events do not become history until they are written, Churchill exploited his skill as a writer to resurrect the reputation of his family name (with a two volume biography of his father, a political has-been), and to consolidate his own fame at every opportunity. As Johnson notes, ‘…with every major event in his life, he [Churchill] told the story as soon as it was over…’ (47) Churchill is remembered as a decisive politician at a time when world historical events demanded it. What is less well known is that he was an inveterate writer. Johnson tells us that Churchill’s account of the Second World War was ‘over 2,050,000 words’ long. (11) He was not, it seems, afflicted with writer’s block. The question is, was Churchill a politician who could write or a writer who could politic? The answer is, he was both. Churchill the politician and Churchill the writer intersect at critical points in his life history. His credentials as a writer were established enough such that when his fortunes as a politician dipped dramatically, he was able to support himself and his family through his publications. For example, when he lost his ministry position in the Asquith cabinet after the Dardanelles disaster, (52-53) he wrote articles for the Sunday Pictorial and Times to make up for the loss of his ministerial salary. (57) And Churchill’s account of the First World War, Aftermath (1929), composed when he was in the political wilderness, was so successful that had he wanted to, he could easily have become a full time writer. As Johnson writes ‘Its success opened before Churchill an endless vista of publishers’ contracts all over the earth, for anything he cared to produce.’ (67) Thus, Churchill was one of those rare individuals who answered two callings, placing one talent at the service of the other to strategically navigate a life course that seldom few men and women of any epoch chart. Stylistically, Johnson’s Churchill is located somewhere between the humanity of Plutarch’s Lives, the autobiographical sensibility and candour of de Montaigne’s Essays, and the poetic irreverence and brevity of Strachey’s Eminent Lives. Johnson does not bother substantiating claims with footnotes, or submitting his own conclusions to critical examination. Moreover, he shies away from riddles and inconsistencies of character and behaviour, by politely acknowledging their existence in passing. Needless to say, more recent developments in biographical writing informed by feminism and other isms, have, it seems, happily passed him by. And yet Johnson’s voice doesn’t lose its authority on account of these deliberate omissions. Johnson’s Churchill might be best characterised as a moral biography where its author seeks to share his admiration for a great life, doing so with boldness and panache and a carefree attitude toward established conventions. The power of Johnson’s Churchill is achieved through the author’s rare talent for establishing an emotional proximity between the biographical subject and the reader. Whether or not one shares Johnson’s moral estimation of Churchill, it is difficult not to concede that he has succeeded in humanising his subject, warts and all.